CooksRecipes has quality, kitchen-tested recipes for boiled, braised, fried, sautéed, skillet and slow-cooked hamburger dishes that you can count on for successful deliciousness. 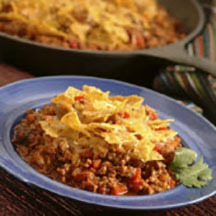 Tasty and quick to prepare, your family will ask for this savory Southwestern skillet meal again. 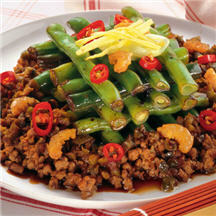 This perfectly seasoned pork with Chinese long beans makes a delicious meal for company. 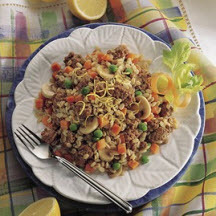 A delicious and satisfying skillet meal featuring ground beef, barley, sliced mushrooms, carrots, onion, sugar snap peas, fresh parsley and lemon peel.